Three ways to measure and stop the insanity. 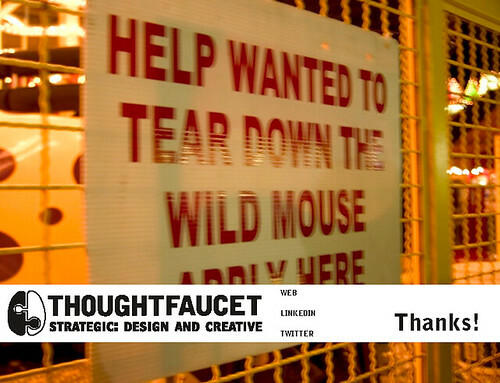 Three Ways to Measure: Tear down the wild mouse. Tear down the wild mouse. The wild mouse just runs around, looking for the next bit of cheese. It has a simple observation system in place: a nose that smells cheese. It has an equally simple action-taking system: run towards the smell of cheese. 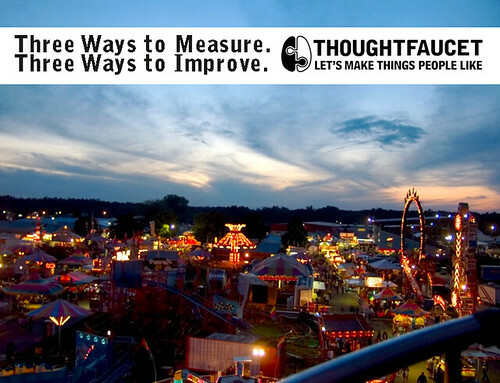 If your organization feels like riding on the back of a wild mouse, maybe you can use the three kinds of measurement mentioned in this presentation to understand the past, prepare for the present and innovate into the future. All by itself this probably doesn’t make much sense. So there are a lot of different ways and reasons to measure. But this presentation focuses on three broad strokes–measuring for ROI, measuring as research, and the relationship between measurement and innovation. Ultimately, the act of measuring alone won’t make your organization operate any better. You’ll want to take actions based on what you measure. Deciding what kind of measuring you’re doing up front will help everyone take the right actions based on the data. 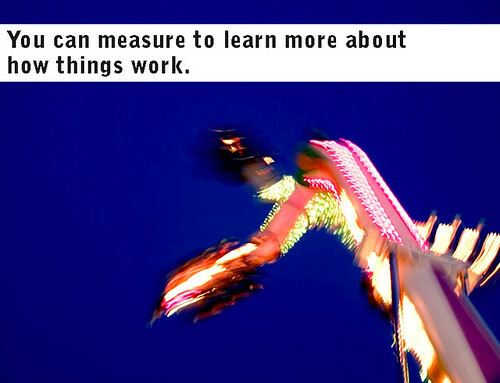 For example, if some of your team thinks you’re measuring for improved motivation while you think you’re measuring for ROI, you’re likely to experience unnecessary tension. Return-on-investment is often a starting ground for measuring in most organizations. The way this works is that you do something (that’s the “investment” part of ROI) and then you see what happens (that’s the “return” part of ROI). You need to measure both your investment and your return for this to work out. Sometimes people just measure the return, say it isn’t worth doing and call it quits. If someone’s not measuring the investment side of ROI then they’re not really doing this all the way. Chances are good that they have some other reason for preventing action. This is an organizational cultural issue and not a measurement issue, though. When done well, ROI measurements prevent you from doing the same thing twice and expecting different results. 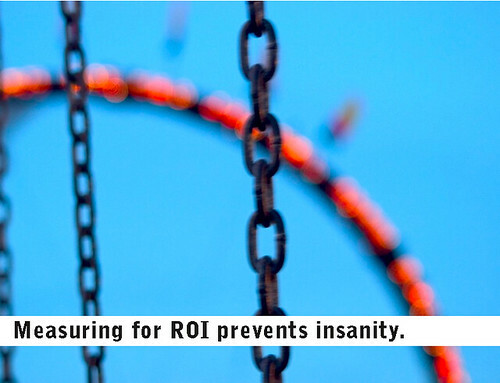 Measuring for ROI is a way to prevent insanity. Online, you can measure marketing initiatives, for example, using URL campaign tagging to see what sort of return you get on various marketing activities. Or you could use time-based or location-based correlation to measure the impact of a traditional, non-trackable campaign. Measuring for ROI is primarily a past-focused activity. You can only measure it properly once it’s been done. If you have activities where past performance is likely to predict future success then ROI measurement can be useful. Otherwise, you might want to use one of the other ways to measure. If you’re planning to do something in the future, you might be able to use measurement to improve your chances for success. For example, if you’re planning an advertising campaign, you might want to research what sorts of phrases people are likely to click on or take some kind of action on. This is where you can do some focused digging into your web analytics: what pages do people visit second (i.e. what pages to people consciously click to read), what are people searching for and where do they land on your site, and so on. Measuring what people are doing with your content right now is a great way to help inform future plans and actions. 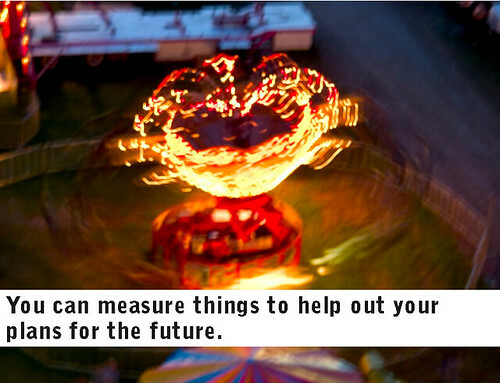 You can use the data you gather to make things better for your future plan. My favorite kind of measurement: looking at the data to see what narratives present themselves. When you’re just observing the data and not looking for anything in particular (not calculating ROI or planning for a specific objective in the future) sometimes you’ll find patterns. These patterns might let you know what sort of problems you can solve for other people. Or maybe the patterns will suggest ways you can improve your website or service or product or entire industry. This is one of those fuzzy kinds of measurement that makes the ROI-focused people crazy. But it can really drive innovation and provide a fertile ground to improve your abilities of pattern recognition. Tear down the wild mouse. When looking at measurement and observation, there are different reasons and ways to do it. I hope these slides from an introductory presentation I did on three different ways to measure and why you might want to measure in the first place were helpful. As you add measurement to the core tasks of your organization, decide how you want to measure. « Site speed is now an SEO issue: 3 things to do to speed up your website right now.